Hand poured in New York City and crafted with soy wax, the small Blind Barber Tompkins Candle combines keys notes of Honey, Smoke, Leather and Lavender; its cocktail of electric accords are reminiscent of the brand's barber shop. 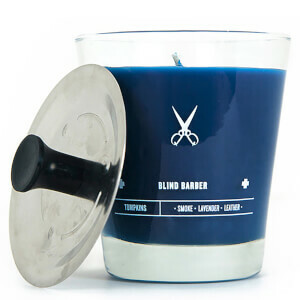 Perfect for any room, the handsome fragrance will inspire feelings of relaxation and calm. Housed in stainless steel and moulded glass jar.